affordable luxury Get started today. We have been in the renovation business more than 15 years. We have many clients due to our exceptionally high standards and our service orientated approach to kitchen design and construction. In terms of home improvement projects, kitchens require more attention to detail and more design coordination than any other part of the home. A good kitchen design team that coordinates the different material finishes and colors well, makes all the difference between an average kitchen and one with wow effect. A good design, besides giving function to a kitchen and a modular look for your cooking space, also gives a comfortable relaxing area to spend time with your friends and family. 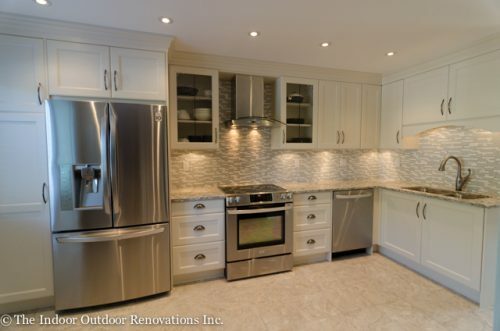 One of the main focuses of The Indoor Outdoor Guy renovations is kitchen reno’s in Richmond and the surrounding areas. We always strive to create the best kitchen for your family, while working with the budget that you have. 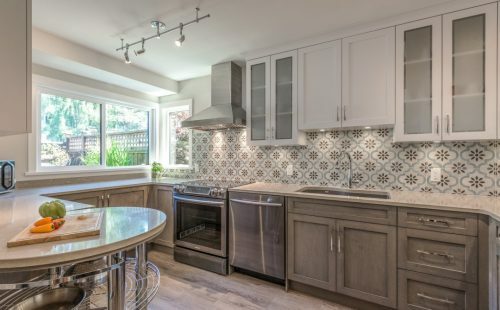 Let’s make your kitchen renovation Vancouver dreams come true! The Indoor Outdoor Guy and his team of renovation experts have the hands-on experience to re-design your house in such a way as to provide more open, comfortable and relaxing living spaces, both indoors and outdoors. In essence, making your kitchen a space where you not only work in, but also relax in while cooking different meals. Acknowledging the importance of the kitchen and the emotions attached to it, we feel our primary job at the Indoor Oudoor Guy is to listen to you, to understand what your kitchen needs and functions are and to get a vision and design onto paper so you can see what it will look like before any work begins. Your happiness with the finished project is what our main goal is. 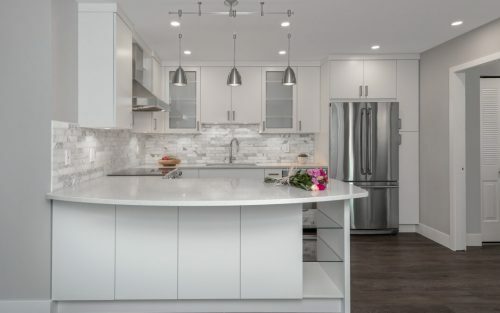 While designing a custom kitchen for you, the counter tops, cabinetry, appliances, faucets, sinks, lighting, flooring, hardware along with other key components of your kitchen, are carefully selected in consultation with you while keeping in mind your tastes and budget. 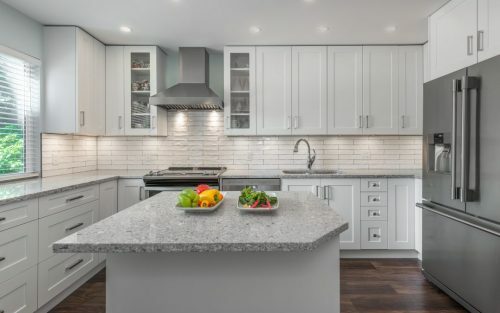 With our company, you have the flexibility to select from a range of different materials such as laminate, granite or quartz counter tops along with other rich colors and textures that work with the decor of your home. Why Call The Indoor and Outdoor Guy? 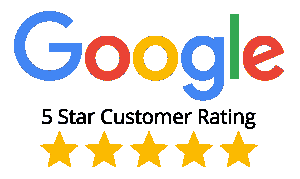 Highly Recommended: We have testimonials from existing clients that are satisfied with our work and recommend us for the knowledge and experience that we bring to the project and the quality workmanship that we deliver. Planning and Design: We work with you to design a kitchen that meets your needs and visually meets your expectations. Every step of the process is planned with you. Reasonable Prices: We charge fair prices for the quality work that we provide. Shared Experience: We possess willingness to share our expertise and advice with you. Professional Crew: All our team members are pleasant, generous, consistent, and punctual. We handle our tasks effectively, professionally and courteously. We work from 8:30 am to 4:30 pm Monday – Friday. We don’t get in the way of your personal life or family life by showing up on weekends or evenings. Goodwill: Rated A+ by BBB, we have been a member of the better business bureau for the last 10 years. Trustworthy: Our performance is guaranteed, and work is warranted, so be free to depend on us. Expert Professionals: All our our staff and sub trades are professionals. Clean and Organized: The worksite is organized and left clean, garbage is placed in our dump trailer and never left on the front lawn. We are one of the few in the industry to invest and use negative air machines to virtually eliminate demolition and drywall dust from the rest of your home. Care is taken because we understand that you still have to live there while the renovation is going on. Stress Free Experience: We are professionals providing stunning finished home renovations, offering a stress free experience. With our approachable nature, we urge you to meet and discuss with us your renovation or new construction needs. Call us and we we will get back to quickly to discuss your needs. 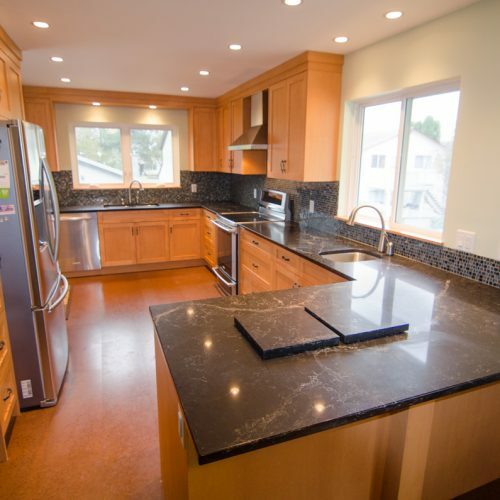 This renovation project involved a completely new kitchen, as well as two new windows. A rarely used patio door at the end of the .. This involved a complete kitchen gut and renovation. This kitchen features new pot lighting, both in the ceiling and under the ca.. This kitchen renovation was part of a larger main floor renovation. For this client we developed a colour scheme that involved wh.. 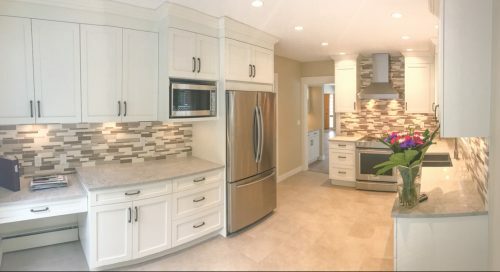 This project involved completely renovating the entire main floor of the clients residence which included the kitchen, bathroom, l.. 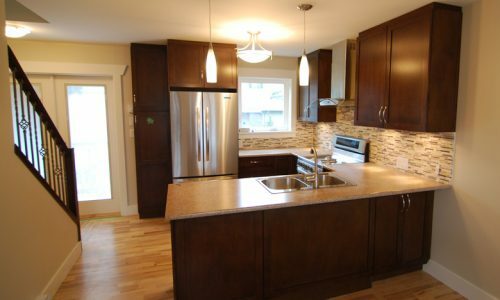 This renovation project involved a completely new kitchen, as well a complete renovation of the main floor of this home. Drops wer.. This kitchen renovation was part of a larger addition project. 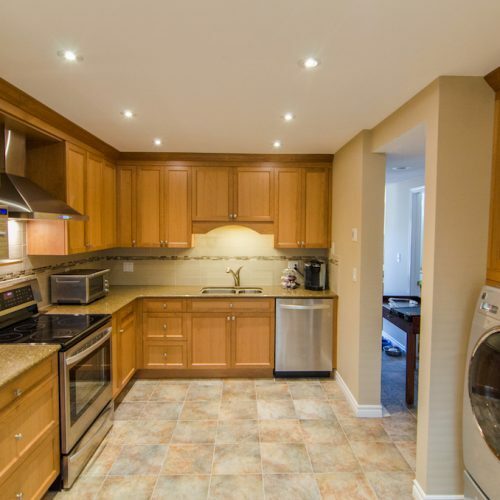 It involved new cabinets, cork flooring, quartz countertops, 18 .. The clients wanted a completely redesigned kitchen and bathroom for their home. 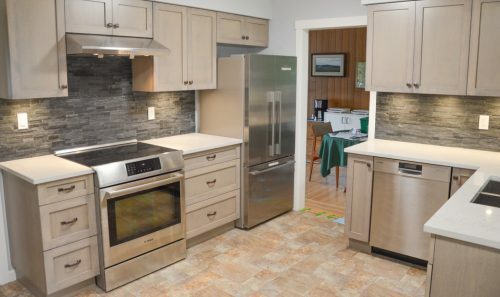 The kitchen features high quality Meritt cabinets.. The client wanted the kitchen to be the central part of the main floor of her home. As such the kitchen located where see can her .. This kitchen went through our design process, which involved three meetings and drawings with revisions at each meeting. The clie.. 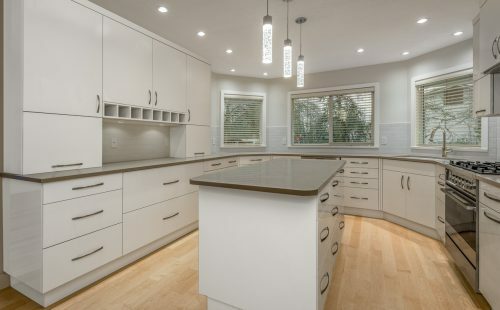 This kitchen renovation included: solid wood cabinets which were custom built by Merit cabinets, the quartz countertop is part of .. 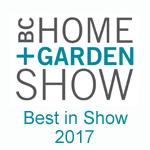 Serving Vancouver, Richmond, Delta and all the lower mainland.